Most of us as a child have a very active imagination & believe that anything is possible! Those of us who grow up and live the dream, are some of the lucky ones! We have encapsulated those dreams of being part of something bigger than ourselves by diving into the unknown with open arms. My lifestyle as a young surfer girl from Saint Augustine, Florida grew into something of a lifelong quest to achieve an aquatic career that seemed only a fantasy -that I was determined to make into my reality. What started as a summer hobby visiting the ocean, Aquariums, or in my pool from almost sunup to sundown, led to the realization early on (at age 12) that I could hold my breath for over 2 and a half minutes. With the nickname “fish” evolving into being called, “Dolphin” as my skill level improved… Trying to experiment by using a garden hose to try to breathe underwater, it quickly became apparent that this was not possible as an option as I had hoped! With my passion to stay submersed as long as possible, free diving was the natural progression that I pursued full time into adulthood. At the age of 13 this small town girl was becoming restless, like a big fish in a small pond. Moving felt like Orlando was Hollywood and the theme park entertainment capital. I quickly found my self in modeling and acting school working on The Disney Cruise Line National commercial, and at age 15 I found a job at Universal Studios Florida. Even then I was driven… With the goal in mind to work as a Ride and show attendant till I caught the attention of the Animal Actor show team, and at 16 was already hired on to be a cage cleaner. This opened the door for me to prove myself, working very hard and finally being part of the show, and even going on location to movie sets with my trained animals. After the thrill of working on so many film projects I moved to Los Angeles, California at 18 years old. This was my first step for a longing to travel and see the world and make a check off my list of “things I wanted to do in life”. I gained a lot of wisdom and the courage to take on the good and the bad in Los Angeles. You need that type of exposure if pursuing the entertainment field to learn what type of person you really are & what you will tolerate. Most importantly you learn how to grow stronger, apply it to how to manage your own your life and career goals. In 2005 that land mark moment for any ocean lover was finally achieved when the water brought me back to Florida, finishing my scuba courses, and got PADI certified for open water. I cannot ever find the right words to describe the freedom given when looking up close at a reef without the concern to come up for air and relish in the moment for as long as my tanks would permit. Once I sank to depths that seem to take with it the light piercing from above, it became clear just how small I am and how little is known beyond below the salty ocean surface. This same year, my career as a professional free diver was checked off my list of goals. Never would I have thought it possible to make a living from something that comes so natural to me and -that I would otherwise have been doing- in my free time if not getting paid to to this. Perfecting my record for breath holds, I worked my way up to 4:18 seconds underwater in 2006 and another on video captured 2013 same spot as years prior at 4:32 underwater! By working diligently on my Static Apnea Breath Hold, laying at the surface of the water allowed me to push the limits further to 5 minutes as a personal best. The next transfer in aquatic ventures was into working with marine mammals. Aquariums have always been an an inspiration to me as a child allowing me access to creatures I would have never otherwise known about. It was hard not to fall in love with their mysterious nature and become passionate to develop a strong rapport. This career path is both physically & mentally demanding. A sacrifice of your personal life that becomes dedicate to a life give to the animals I worked with. It is not a 9am to 5pm job. Having a career in an industry with marine mammals, I find a perspective of all sides of conservation issues. Understanding the value in it’s education to view marine mammals up close for a lasting impact, yet also understanding the shift that is increasing worldwide towards seeing animals in a more natural environment. I grew up by an inlet coast called Flagler County, Florida where dolphins were constantly around me when I would swim. I can recall holding my head underwater unable to see anything but hearing their clicks all around me like a secrete code to come into their world. When it came time for me to work with these animals face to face, the adjustment came very easy having studied Marine Biology since I was a teen reading up on these fascinating animals of the sea. My respect for the how fragile our blue planets eco system is grows daily from the relationships with animals, knowing that if we do not help them, who will? The tough decisions we all have to make together, determines our fate on how the planet thrives, how we survive, and will reflect on how we treat others in the future. My aspirations as a mermaid has truly transformed me in more ways than the obvious. It is a self-made journey born out of love for the sea, that continues to grow from the years of hard work creating a business from the ground up completely on my own with no outside financing or sponsors. The back story of this is very deep rooted. 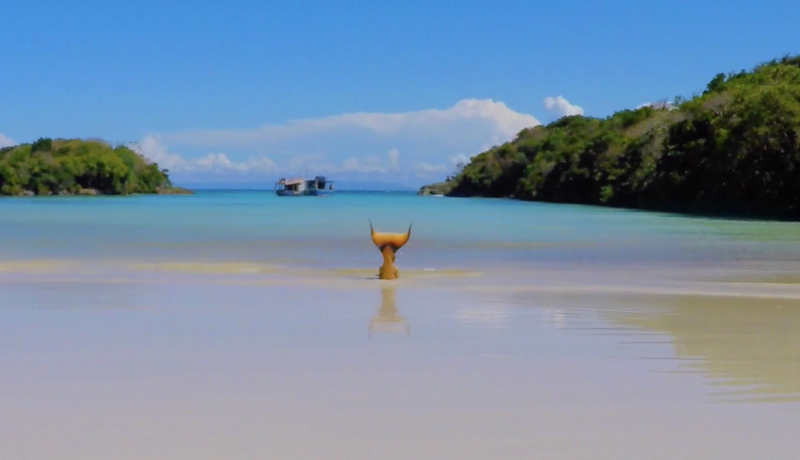 It was the ultimate fairy tale for any young girl who has watched “The Little Mermaid” and “Splash” -a way that I viewed to find a balance between staying human, and joining their world as part dolphin. Through much determination and imagination, I ventured into a field that no one viewed as an actual marketable skill & focused all my background knowledge into making this happen. By spinning an educational message that is fresh & new, I continue to invite others to join me on new adventures on how to enjoy, save, and continue to share with others how to protect our blue planet. 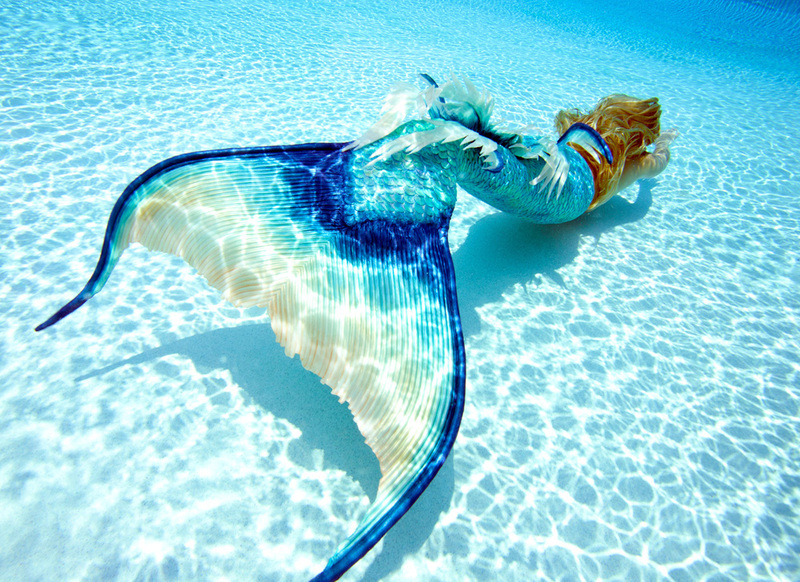 My future as a professional mermaid has reached great achievements but the potential for my company mission has many more chapters that are about to be written. Our belief in dreams coming true can be lived, with each new passion that we pursue! With the momentum building from a lifetime of aquatic skills growing and evolving in my life daily… I have found my calling to reach the masses with a message, “Let’s save the oceans before all creatures become mythical.” As a mascot for the marine animals who have no voice, I worked hard to entertain those with a positive message on how to save our seas without the negative backlash one usually hears about how depressing and bleak our future could be. Becoming a source of inspiration to motivate others to peruse their own passions in life, and help with a good cause close to their heart, that will in turn inspire others. 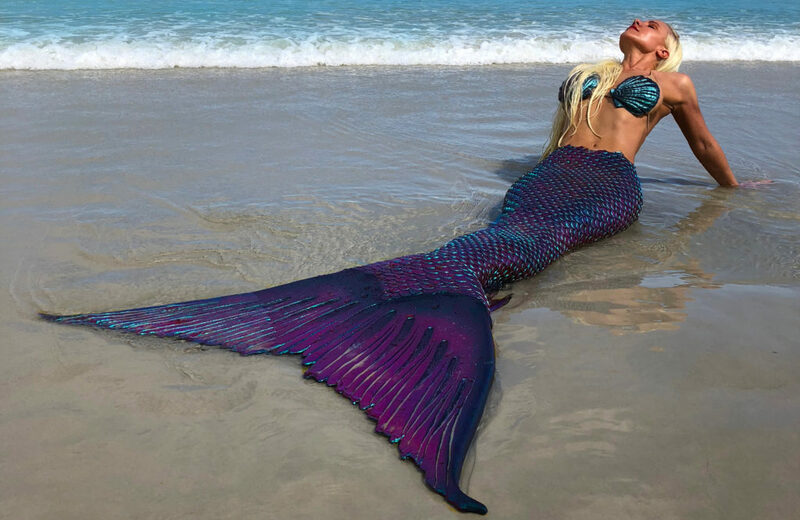 What is a professional mermaid for hire? With personal credentials including extensive high profile experience working for multiple aquariums, hands on experience with marine mammals, utilizing my background managing underwater shows, & being a professional free diver, was just a few of the invaluable set of skills that helped shape my mermaid resume. 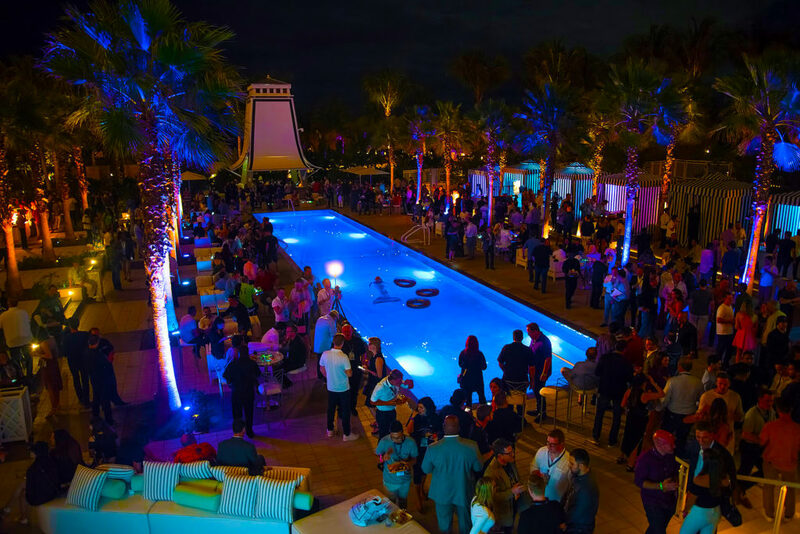 Both dedication and discipline to the mermaid company brand is evident by also providing services & talent that no one else in the world can match. 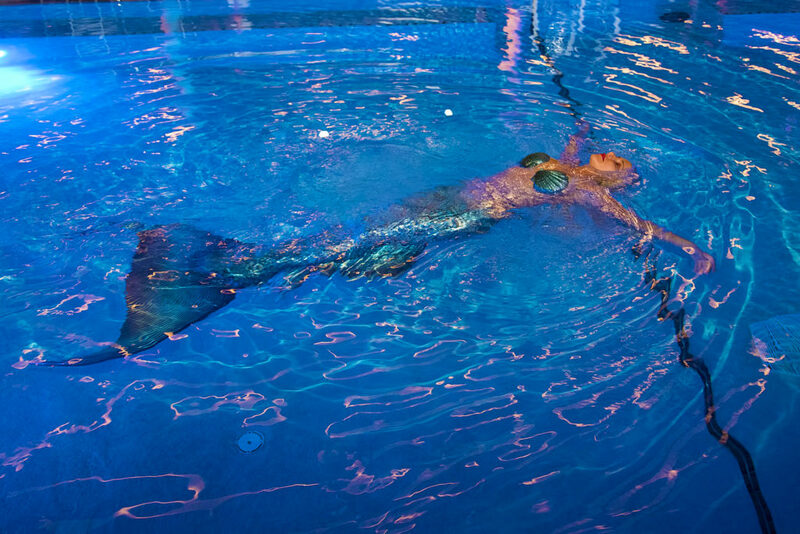 The most complex array of customized mermaid tails, show experience, equipment, 6 mermaid tanks, and full service aquatic performance team. 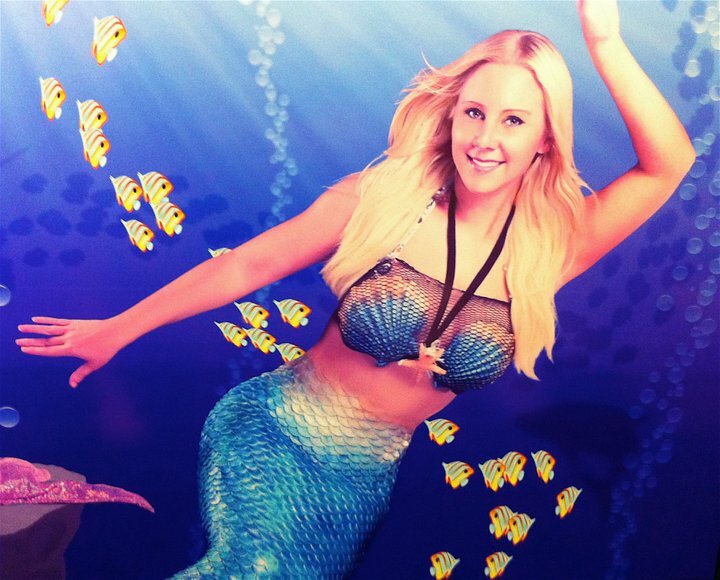 Of the hundreds that have applied, & of few who made it to the audition process… Only the most qualified make the final cut who eventually move on to an active role as professional mermaid hired to perform at a live events with my company. When there is water involved, safety and experience go hand in hand, which is why so few ever make the final cut to expand our team. We believe in quality over quantity. 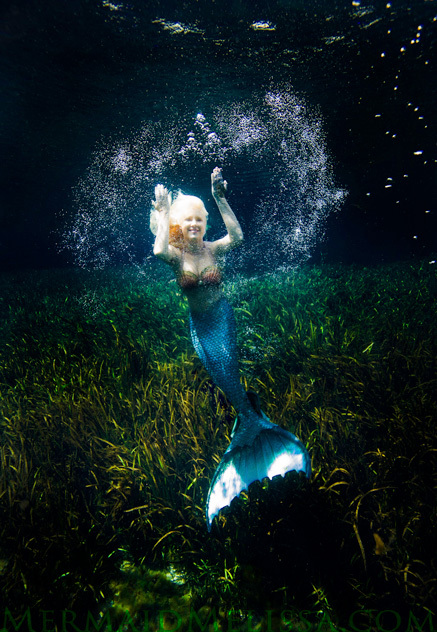 Environmental: efforts for the preservation of helping to save our oceans, “Mermaid Melissa” became the official legal name change. As I vow to live true to a cause close to my heart, and serve as a daily reminder that this is a life long process to learn, evolve, and be willing adapt to change for the sake of something bigger than ourselves. If we hope to spread a message to help save our blue planet and all that makes it unique, remember that one act of kindness through conservation can make all the difference. Currently she is actively involved with joining ocean projects to generate awareness for our fragile ocean Eco system by swimming with the animals of the sea for photo shoots, films, documentary projects, and independent movies with similar causes. 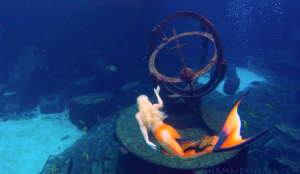 2015 has seen Mermaid Melissa swimming in the Caribbean Sea with the stingrays, eels, sea stars, diving in shipwrecks, and exploring the local culture of the Cayman Islands beautiful coral reefs. 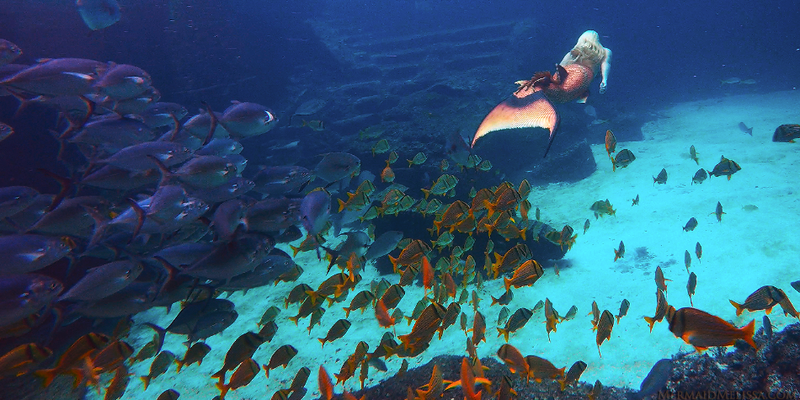 During this visit to Grand Cayman, a large event was open to the public advertised on the news and interviews as a real life mermaid. Australia: I performed in a giant fish tank 40 foot long outdoor display aquarium for a live public event. Partnering with eco friendly private islands such as Great Keppel island, Lady Elliot island, and Heron Island. It is an awe-inspiring and life changing experience to swim along side giant Manta Rays, sharks, dolphins, humpback whales & thousands of marine life teaming together in harmony at The Great Barrier Reef. I feel honored to be sharing my life along side such beautiful creatures that I witnessed living among some of the most beautiful coral reefs I’ve ever seen. leading up that made working with her exceptional. guest will be talking about for years. 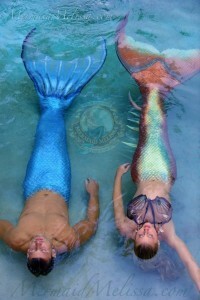 recommend Mermaid Melissa for her exceptional social and mermaid skills! Contact me at MermaidMelissa@gmail.com for more regarding client feedback & event bookings.